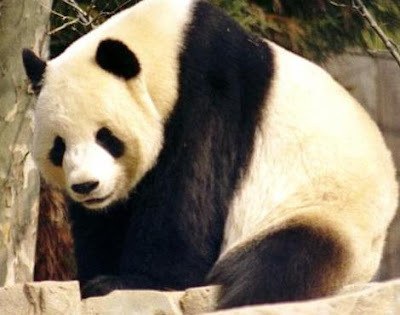 The Giant Panda Bear is one of the most recognizable & unique bears in all the world. The Chinese people's national symbol of peace is also the World Wildlife's Fund logo. Since its discovery by a French naturalist in 1869, this endangered mammal has gained worldwide recognition as a symbol of conservation. 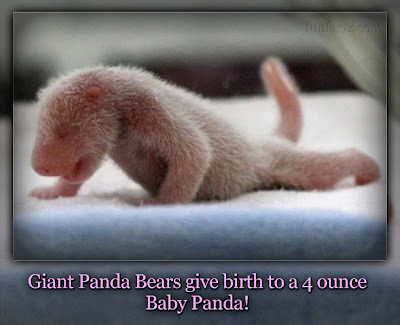 The Chinese word for Panda is Xiong Mao, meaning Giant Bear Cat. 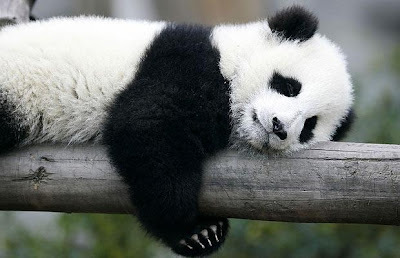 Did Ewe know that I'm referred to as the "Bamboo Bear"? Ewe have to admit, that I'm simply adorable! 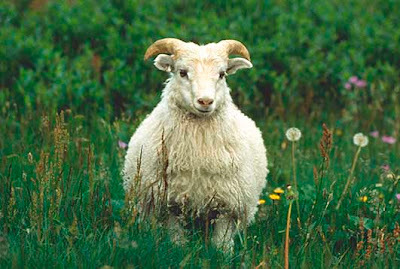 Can't Ewe see that I'm rather NEEDY? Ewe would cry too if I happened to Ewe! I bet Ewe would never guess that 4 ounces could grow into 300 lbs.! 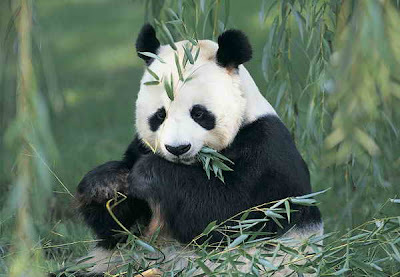 Giant Pandas eat from 12-15 hours a day! Bamboo is almost 99% of their diet, however, they will supplement their diet with plants, grasses, fruits, birds, & small rodents. 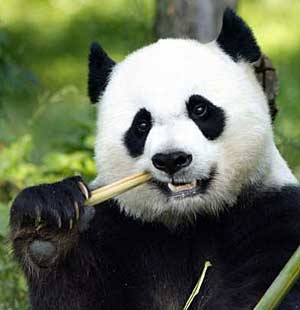 They actually consume an average of up to 30 kg of bamboo a day, which is close to 70 lbs. of bamboo! Wow! 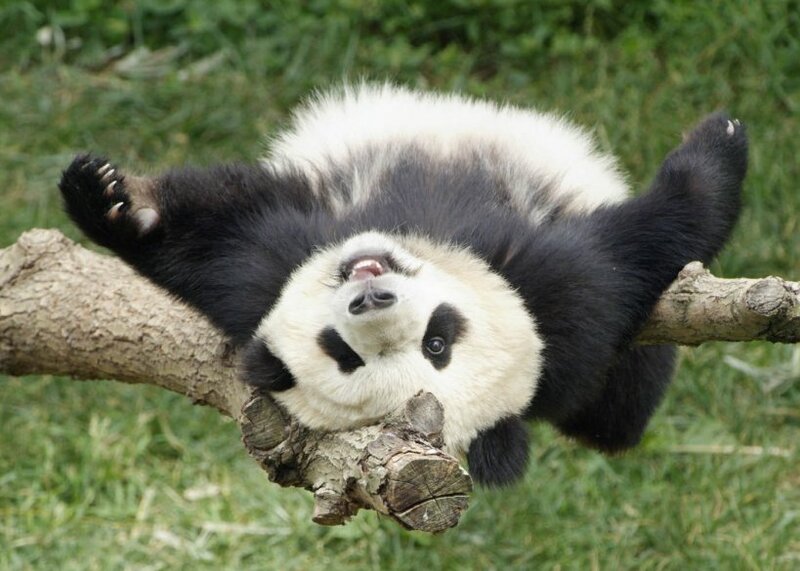 Pandas in the wild feed mostly in the high forests of western China, where mountain streams are readily available. 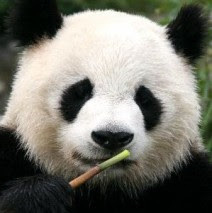 They are equipped with powerful jaws, flat molars, front paws, & an extended wrist which functions as a thumb, all of which aid in eating bamboo. Have Ewe ever loved something so much , that Ewe couldn't put it down? I'm not trying to "Bamboo"- zle " Ewe. I LOVE BAMBOO! The Giant Panda marks its territory with glandular secretions & scratch marks on trees. Males, also called boars, weigh from 250-300 lbs., & occupy territories that are twice the size of females, also called sows, weighing up to 250 pounds. These shy pandas avoid humans & will mostly live solitary lives , except for brief interactions for mating purposes. They are good climbers, have an excellent sense of smell, & keen eyesight. Females give birth to 1 or 2 cubs every two years. They stay with "MOM" about 18 months, before they are old enough to go it alone! 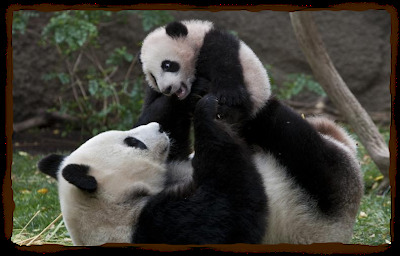 There are presently 1000 pandas in the wild & between 170 - 180 in captivity in zoos. Their life expectancy is about 15-20 years in the wild & 30 years in captivity. Mom, would Ewe please stop tickling me? Sheep have appetites that require a Shepherd's oversight & monitoring, in order to produce the healthiest results. Unlike the Panda, they chew the cud after eating & are satisfied with much less food. Can Ewe tell that I'm happy ? As Ewe graze in the pasture Ewe have been assigned to today, allow the Good Shepherd to feed Ewe with the finest of foods! Happy trails to Ewe!